The 2011 Lorca earthquake confirmed once again the treacherous relationship between reinforced concrete frames and masonry infill panels. The city was left with many examples of permanently deformed ground floors, fragile non-ductile damage to ground floor column heads and shear-damaged infill panels. However, if these damage patterns are so well understood, why are they so recurrent? This exercise explores how shortcomings in code provisions, hopeless planners, hapless architects, fractious developers and peevish engineers all consort to perpetuate risky urban environments. The paper concludes with a form-based design approach to assist in multidisciplinary earthquake resistant design education. Patrick Murphy graduated as an architect from Canterbury and Kingston universities in the United Kingdom. Patrick has been active for many years in seismic engineering research, specialising in earthquake resistant design, vulnerability and seismic risk. He has co-authored the Seismic emergency plans for civil defense for the Spanish autonomous regions of Murcia, Andalusia and Navarre. 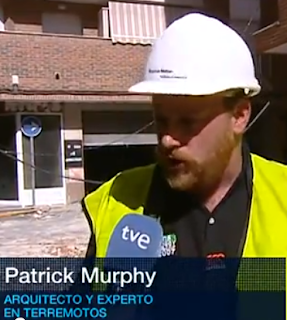 Patrick is frequently on the field in damaging earthquakes in the Mediterranean region and a frequent contributor to field reports. He recently authored the chapters on building damage after the Lorca 2011 earthquake for the Spanish Geographical Institute's official report. Currently he holds the position of Director of Architecture in Broadway Malyan's Madrid office, a leading international design practice, where he leads large scale architectural and masterplanning projects in Europe, Asia and Latin America. Broadway Malyan is a global architecture, urbanism and design practice. Distinguished by a global reach with 15 offices across world centres, unrivalled diversity with 500+ sector experts and distinctive client focus with over 80% of 2011 income from repeat business, BM create world-class and fully-integrated cities, places and buildings.